Have you ever taken a stroll through a wood and felt that you were being watched? Yet when you turn around, no-one is there. You carry on with your walk but that feeling of disquiet lingers. Perhaps you were being watched by something almost as disquieting as that galloping, mad axe murderer you were dreading. 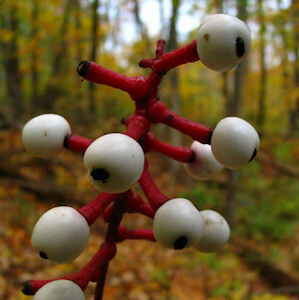 The Doll's Eyes Plant could be eyeing you up as you innocently ramble. In North America, not just the hill have eyes.